← Sanity – buckled and wrecked by politics. Caution: This tale has two possible endings; Final Para [A] or [B]. The choice is yours. Every day, the government sold an apple to each of its citizens. These apples were grown on a government farm which was looked after by government employees. Being a normal government operation, staff numbers and staff wages were kept to a minimum. Under this arrangement, citizens were charged 15 cents per apple which covered all operational overheads without making a profit. Enter (stage right) the clever dynamic progressive politician who feels this apple service should be privatised. Naturally, this has nothing to do with his recent discussions with a private company. The politician pacified concerned citizens by telling them there would be NO change to the price and availability of the apples. Indeed he said, it would promote “competition”, and probably lower the price of apples. So the apple farm with its sales operation was sold to a company which had outbid other contenders (that’s the “competition” element covered). Now that it had a new owner, there were a couple of extra aspects to be taken into account. The new managerial staff are on higher remuneration packages, and the company shareholders need to be taken into account. Normally, these additional overheads would have increased the selling price of the apples, but the CEO controlled this by employing less farm staff, and paying them lower wages. Thus there was NO (immediate) change to the price and availability. All shareholders were cautiously happy. Within 18 months, the CEO’s bonuses plus growing shareholders’ dividends put further financial pressures on an already struggling farm. As a result, management doubled the price of apples and halved the farm staff, publicising this as being “unfortunate” but due to increased market forces and competition. Exit (stage right) the politician (not re-elected). Within a year, there were further “unfortunate” market forces which, once more, brought increased prices and staff reductions. All shareholders were very happy. Two years later, the apple farm and sales operation were sold on to another company which was controlled by overseas interests. They soon stripped the apple business of its assets and it ceased to exist. All shareholders were extremely happy. Locally produced apples were no longer available. 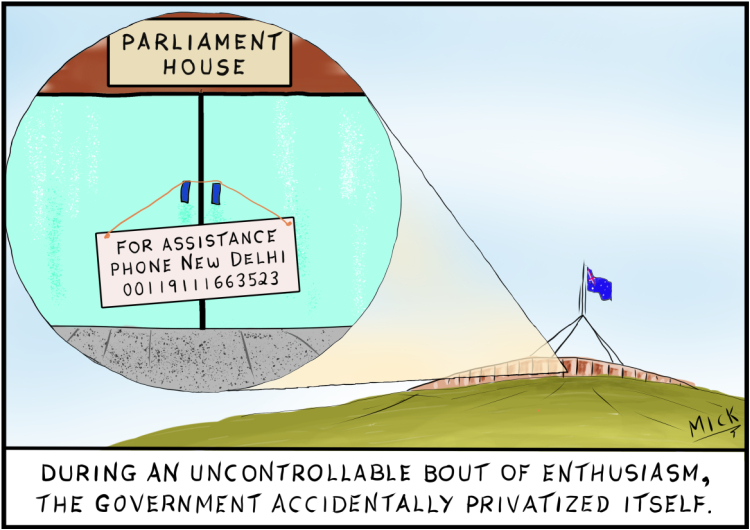 FINAL PARA [A] Government proceeds from the original sale were used to send politicians on overseas fact finding missions, with a focus on how to maximise benefits of privatisation activities. FINAL PARA [B] Government proceeds from the original sale were used to send politicians on overseas fact finding missions, with focus on how to grow cheap apples for its citizens. Posted on April 29, 2017, in Cartoon, illustration, humour, humor, caricature, political, art, Australia, Perth, cartoonist, Illustrator and tagged Government, humour, Privatisation. Bookmark the permalink. 7 Comments. It’s a crazy world, don’t know my apples from oranges! If it’s crisp and crunchy, it’s probably an apple. If it’s soft and juicy, then there’s a high chance it’s an orange, or a very very old apple. This is way to close to the bone to hit “like” — but consider the “great post” button clicked. Ah…. what a marvelous idea, perhaps WordPress could introduce “like” buttons with varying levels of “like”. L1 thru L5, where 1 is “not bad” and 5 is “BRILLIANT”. “Great post” can be L3. L2 and L4 can be left to the imagination of the liker (is there such a word?). 🙂 If not there should be! Oh, and thanks for the “great post” pat on the back.